Danny is almost inducted into the army, but is rejected because of his height! • Jonathan Daly was also in Episode 16. • Laurence Haddon played Coach Dawson in Episode 32. • Jared Martin is best remembered for his roles on "Fantasic Journey" and "Dallas" (as Dusty Farlow). • Jack Riley is best known for playing Mr. Carlin on "The Bob Newhart Show." • Director Claudio Guzman was the staff director on "I Dream of Jeannie". 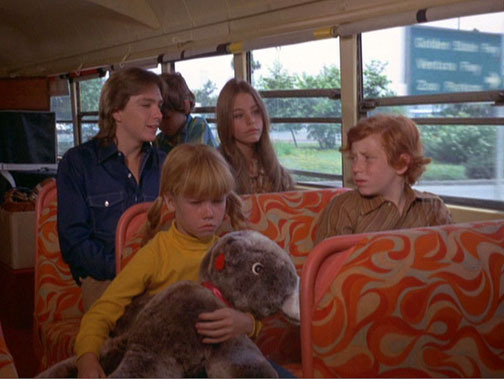 • The Partridge Family's first album, according to this episode, has a photo of them painting the bus on the front, and artwork of a partridge on the back. This episode has never been one of my favorites, although I do like using a recording session to showcase the week's song rather than the standard concert shot. 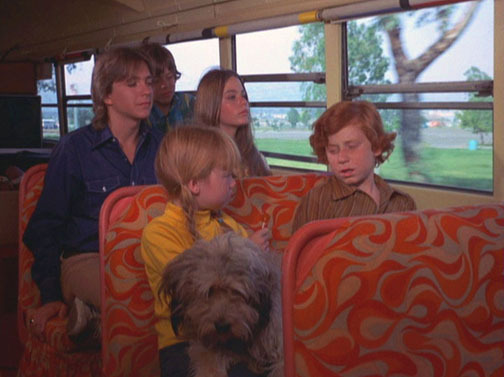 The song for this episode, "On The Road," is one of the few where David did not sing lead vocals on LP, although he DID record them. I originally thought that the song was recorded before Wes knew David could sing. But, if you look at the recording notes that Ron Hicklin gave us, there were songs that David DID sing lead on, that were recorded prior to this song. Both "On The Road" and "Singing My Song" were recorded on May 16, 1970 and then re-recorded on June 11, 1970 which leads me to believe that the choral sound fit the song better. It also makes me wonder if there's a choral version of "Singing My Song" floating around somewhere . . . . but, that's just me speculating. The episode also indicates that the Partridges don't live near Los Angeles -- although any continuity will be thrown out the window in the later episodes, along with where Reuben lived in relation to the PF. This first shot shows the Gothic-styled church. It's situated next door to the PF's home. In a few months it'll burn to the ground, and will be replaced with a generic-looking home. Recently that home has been remodeled a bit and is now used as the Heck's home on "The Middle." In case you live under a rock, that's the "Bewitched" home at the end of the street. For the most part, this episode was filmed inside on Soundstage 30 on the Columbia Ranch. 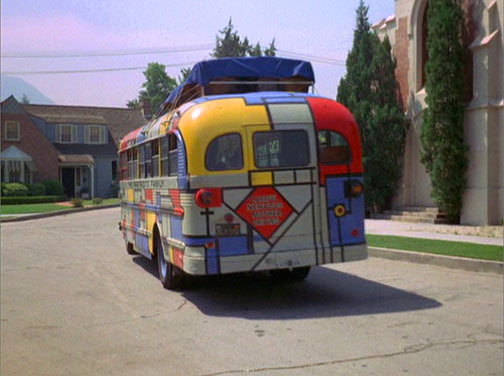 They took the bus out and filmed along the 134 Freeway in Burbank, not too far from the main Warner Bros. lot and Forest Lawn Drive. You can see the Freeway sign for the Golden State Freeway, Ventura Freeway and Zoo Drive outside of the windows in this next shot. I can't think of anything else noteworthy, except Mr. Carlin from "The Bob Newhart Show" has a small part as an Army Induction Recruiter. It was directed by Claudio Guzman, who directed about 99% of the "I Dream Of Jeannie" episodes. It's one of only 2 episodes he directed. Didja also notice that Tracy is holding a stuffed animal in one shot, and Simone in the next? Loving the photos along with the trivia stuff, Scott!! I guess Simone was the stuffed animal's stand-in! Watching this episode today, it seems a little politically incorrect for a show as squeaky clean as this to suggest something as subversive as the army being so incompetent that they would actually draft a 10-year-old boy, and would only disqualify him because he was too short. That puts it into a cooler category for me all these years later. I agree that it's too bad they didn't use the actual Partridge Family Album cover, but it created a mystique for me that there might be another album out there that I didn't know about. Album was actually the fourth PF record that I bought. My best friend at the time had Album on 8-track (ah, 8-track! ), so I bought Up To Date first. Then, months later, when I had the money to go to the store and buy the first one, Sound Magazine was already out. It was such a cool surprise to me that I had no choice but to put off buying Album yet again. Then, before I could save enough money to get Album, a schoolmate of mine came back from Christmas vacation in Germany with a copy of Shopping Bag that he didn't want and he sold it to me for two dollars! Eventually, I did buy my own copy of the first album, but that was only because I was feuding with my best friend and I missed that first album more than I missed him! Another memory I have of this episode is watching it in the 80s when it was rerun on our version of MTV, MuchMusic. By then, I was struck by the fact that Dusty Farlow from Dallas (Jared Martin) was behind the board in the studio! Another digression...The Partridge Family was taken off MuchMusic back in the 80s NOT because it wasn't popular...the ratings for it were actually very good. It was taken off because other channels complained that airing the show went against the licence for the channel because the show didn't have enough music. That's laughable today, when you consider how little music there actually is on channels such as MTV and MuchMusic! One of the funniest moments in this episode for me (both now and way back then) is near the end, when Danny agrees with Rueben that liner notes were not necessary on the album, and that makes Rueben question whether his original decision was right, because he never agrees with Danny! They had such a fun relationship, looking back! Of course, they were BOTH wrong! How I loved reading the liner notes on The Partridge Family Album when I finally bought it! Since my friend's 8-track didn't include the liner notes, they were the only thing about the record that was "brand new" to me when I finally bought my own LP! I read those liner notes over and over! I won't keep saying it week after week (or maybe I will), but I have to say that if there's one thing that makes me happy I ever suggested this weekly DVD Club get-together, it's the delightful photos and insight provided by Scott "Awesome" Awley! I truly appreciate it! Awww, shuckles -- thanks! It's fun to dissect the episodes with the photos, which I also plan on using elsewhere on the site. Not too many people are participating so far, although there are lots of readers. One of the things I forgot to mention was about the fantasy sequences. I think this was only one of two (the other being "Star Quality") that used a day dreaming/fantasy sequence. I thought they were a nice touch. A friend was over the other day and we were watching an episode. He was curious as to why the PF had a 5-day shoot, when most other sitcoms had a 2-1/2 day shoot to complete an episode. I didn't have an answer, as I was under the assumption most sitcoms filmed in a week. But, I think this episode explains. With the location shooting, various army settings, and the musical number I can't imagine it being filmed in 2-1/2 days. Plus, they had the kids in school and you can only work them so long. Susan was only 17 when the series started, so there were limitations on how long she could work, too. If I recall, when she arrived in Los Angeles from being "discovered" in New York (by Paul Junger Witt,) she stayed with the Bonaduces for a while. Later, she had her own place but had to live with a guardian. I'll had to dig out my old PF magazines. I think her name was Jan or Jane? Or was that David's stand-in? I fergit. I especially enjoyed the recording session of "On The Road" (which I simply LOVE, and still hope we'll all someday be able to hear David's version). It always makes me feel like I'm getting an "insider's view" of an actual recording session, something that has always fascinated me, and which I've always wanted to witness. I enjoy the final scene as well where Chris' "chocolate hand" stains the album cover, and Reuben and Danny actually agree on the decison regarding the lack of liner notes. What a comedy team they were! I know the cover was merely a prop, but I can't help wondering what happened to it -- and HOW COOL it would be to have as part of my ever-expanding DC/PF collection! I think we should change our names to Digression. Sabrina Digression. Whaddya think? GREAT idea!!! Maybe we could form a singing group called "The Digressions". We could all dress up red velvet suits with white-ruffled collars and sing PF songs! Of course, before anyone could ask WHY we chose THAT particular name, a certain member of the group who shall remain nameless for the moment though he knows who he is, would undoubtedly (Puckishly enough ) "digress" into a Brady Bunch "song"! We need an adjective, a la The Smashing Pumpkins or The Rolling Stones. How about The Tedious Digressions! I'm sure many of our fellow HappyCats here would agree! Once again, thank you for the photo's and info Scott. And a thank you to TVGord for starting this great dvd watchers club. After watching this episode, it really hit me how much I enjoy kicking back to watch a PF episode every Friday evening, and then coming here to discuss them. Another great episode. I know it must have been talked about before, but I love how Shirley goes from sweater/hat to no sweater/hat, and back again on the bus trip. I think these little goofs are great. I saw a crew man in the bus window's as the family was leaving for the studio, never noticed it before. Ahhh the song.....I love On The Road, it is one of my most favorive PF songs. Every time I hear it, it's like the very first time. My mood picks right up, my heart start's pumping, it just makes me happy. I too would love to hear David's take on it, and a stereo version would be great as well, but seeing as it's all we have...for now ... the mono rocks. I am also one of the many who wish I could ad the very "first" PF album to my collection. I think this is the first PF episode that has the horn swell music, as Shirley is leaving Danny's room, after they get back from the studio trip. I've always loved it, it's a sweet little piece of music, and the fact that it's a part of my favorite tv show, makes it even better. omg! after seeing this episode, I remember looking for the album they had (the one in the pics....thanks Scott) in the stores. This is a fun episode to watch, I love the studio recording of On the Road. P.S. Thanks Scott so much for the pics and comments you've been adding to each episoded guide. This is the first of several enjoyable Turner/Mitchell episodes. We get to delve a little deeper into Danny's amusingly precocious mind here (his Army daydreams are a hoot). DM has some memorable moments, too ("Danny Partridge in the Army. What a lovely thought."). And I, also, liked the "On the Road" recording session in this ep. It seemed a little more realistic than it would in Season 2 (not that I'm claiming to know anything about recording studios, etc.). All in all, a fun one. As far fetched as this premise is... a ten year old getting almost completely through the Army induction process... it is fun to watch it build and build to the inevitible realization (and Danny just calmly doing what he's supposed to). A friend of mine calls this a "Lucy show device" because she had so many far-fetched situations to deal with throughout her on-screen career, and I am sure even she wasn't the first to do it (it probably dates back to vaudeville or earlier). The exchanges between Danny and Dave M were again very clever. "On the Road" is a rockin' song! The time and energy spent putting together the arrangements really shows that this show is no "slap together and get it on film" project. The quality of the music is a huge reason (imho) the show lasted as long as it did. And how cool would it be if they used the prop album design from this episode as the basis for a "lost songs collection......? And again the family seems so natural and comfortable together, solidifying the comedy of the situation. Scott, every time I post I intend to also thank you for the great behind the scenes history and fab pics you put together, and until now I get so caught up in the episode I forget. So, tahnk you thank you thank you. It gives us a great context not just for what happens in each episode, but also for how the show got put together. This club is great fun, thanks TVGord and everybody for your insights and memories! I don't really have anything to add, except I too love the idea that this 'kid' show takes on the army, which reminded me that the scripts really were geared toward adults. Like Bugs Bunny. Also, I seem to recall from DC's book that they were given an extra day to shoot the show, because the music scenes were so difficult to do. Oh, and yes thanks Scott for all the inside scoop, it's so much fun to know it all!